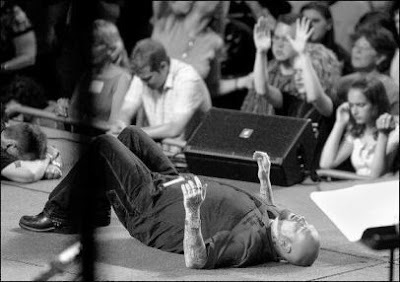 Redefining "Charismatic" 1 : Reform worship. As I am composing this post (composting), sitting here on my couch Thanksgiving afternoon, my brother-in-law asks me what I am doing. "Redefining 'charismatic,'" I says, to which he responds, "What're you, Webster?" No, I am not Webster, but I am charismatic. And no, I am not attempting to create and submit a new dictionary entry for the term "charismatic." All I can do is speak from the influence of Scripture and from personal experience: growing up in a charismatic Pentecostal church, attending a very charismatic Bible college, having several other various interactions with charismatic individuals; then swinging to nearly the opposite side of the pendulum on the border of the cessationist camp: fellowshipping among the people of practically (although not theologically) non-charismatic churches, attending a conservative seminary where charismatic expressions of worship (as commonly understood) were virtually non-existent and less than encouraged; and then on to where I am today, which is still leaning toward the non-charismatic side but closer to the center, as you will see. Of course, problem number one is thinking in diametric terms (right or wrong, left or right, black or white), when I truly believe the issue at hand can only be understood on a holistic plane, where a true worshiper is 100 percent the best of all sides. And I will try to identify what is the best of all sides, but before we jump in head first, I should tell you that I have been working on this series for quite some time, as you can see from the opening sentence of this post. This is by no means an exhaustive look into the subject of the charismaton; it is not my goal to expound upon the different kinds and functions of biblical grace gifts - although it might be a worthy endeavor revisiting with and open mind current expressions of prophecy, tongues, etc., which I do think can occur within the boundaries of Scripture, but which are thrown out by many Christians, especially those in the upper echelon of the academic community. Rather, it is my aim to think about and discuss charismatic in terms of our emotional and physical manifestations of the Gospel at work in our lives. And even as I have benefited from meditating on these things, I hope you will do the same. This is an ongoing conversation, knowing full well that my understanding will continue to evolve as I grow closer to Jesus. This series will consist of four posts, this Introduction being the first. In the next one I will talk about two kinds of church-goers: Counterfeit Charismatics and Uninformed Non-charismatics, both of whom I will hesitatingly label as unregenerate. In the third post I will talk about two other kinds of church-goers: Informed Non-charismatics and Genuine Charismatics, both of whom I will classify as regenerate. And in the last post I will get practical and talk about what needs to happen in order for us to grow into the kind of worshiping Church that I believe God intends for us to be. Finally, it is helpful to know at the onset that I do believe the desired camp is the Genuine Charismatic one. I am working with the underlying assumption that when the powerful, living, active Word of God, the Gospel, the body and blood of Jesus Christ, gets into a man's soul, it must affect him physically and emotionally. It's what Jonathan Edwards in his Religious Affections calls the "miraculous unity" between the body and soul. Again, we often and ignorantly separate the body and soul, forgetting that it is through the senses that we both receive and respond to the most purely spiritual message the world has ever heard, the Gospel. Not to mention God is completely spirit and perfectly human in the glorious body of Jesus Christ even now. And we are created in His image. Counterfeit Charismatics, meaning they are outwardly manifesting something other than an inward move of God because it is not the true and living God who is affecting their souls. In their nakedness, they are vulnerable to all kinds of elements, seeking God’s revelation in emotional experiences rather than His Word. Buckle up! This is going to be a fun one. I was raised in a Pentecostal church and find myself attending a congregational church right now. For a while I called myself "The Accidental Baptist" but of course there wasn't anything accidental about it. I am presently in a searching and rethinking time. I'm looking forward to reading this, Ryan. My husband and I are a strange conglomeration of experiences with and beliefs about the work of the Holy Spirit in our lives and our worship. I'll keep reading. Maybe you can help us find a new way to define ourselves to other folks--since no one ever seems to understand our current definitions and explanations. I also look forward to what you have to say about the different types of charismatics. Being a worship leader for many years, it certainly becomes obvious over time, it certainly becomes easy to see where some people are in their "charismaticism", so to speak, according to your definition. When I first started, I used to take it personally if they weren't expressive in their worship, as if it was me that could cause them to worship. However, it was also such a joy to see those people finally 'break out of their stalls' and give themselves fully over to the Lord as they worship with all their heart! Currently, I have started a new journey of study on worship and the theology of worship, ironically after many years of leading. So I will be blessed by what you share! Originals: "Communion with the Trinity"